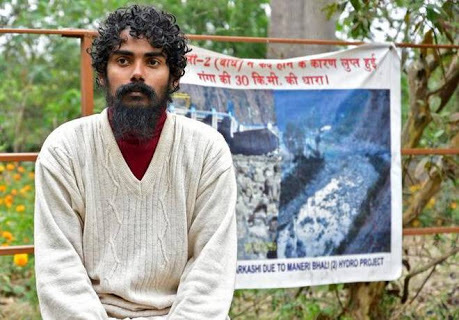 As already reported, a United Nations Permanent Forum on Indigenous Issues team visited Haridwar in support and solidarity with 26-year old Sant Atmabodhanand, who hails from Kerala. He is fasting for making River Ganga Aviral (free-flow) and Nirmal (pollution-free). This feisty and strong-willed youth stands up like the mighty Himalayas for the indigenous rights for Ganga that we call as Mother and the crores of indigenous livelihoods of farmers, fishermen, herder, boatsmen and so many other diverse indigenous communities for whom the free-flowing and pollution-free river is the lifeline. Friday, March 22, marked the 150th day of his continuous and indefinite fast till the time the demands are met or he breathes his last. The UN team visit was at the behest of GAIA -Global Academy for Indigenous Issues. The team consisted of Phoolman Chaudhary, Asia representative at the Permanent Forum on Indigenous Issues (PFII), his press secretary Hari Paudel and Nepalese parliamentarian Metmani Met Chaudhary. We had great support from local teams who made this visit a great success in sensitizing the behemoth Government of India to the plight of the river and the indigenous people, and to make them sit up and listen. Ashish Goel and his team at Haridwar, Dr Chinmay Pandya, pro-vice chancellor of the Dev Sanskriti Vishvavidyalaya at Haridwar, Hitesh Chandel and his Defined Values team in Delhi NCR, Nirmala Pandey, BK Jha at Noida among several others. Being thinly funded, we are yet to reimburse the UN team for the travel expenses despite our onerous efforts. We hope that the mainstream media wakes up to the grim reality of dying rivers and depleting forests in the deluded and desperate chase of "development" which is pushing crores of Indians into misery and destitution dispossessing and disempowering them of the natural resources and eco-systems that generate their livelihoods at the cost of providing comfort to a few and shrinking diseased folks in the cities -- bureaucrats, politicians, media, sychophants, parasites, power-brokers and their cronies. As the anger and frustration of people gathers more steam and the rage turns into fire, it is likely to burn down their castles made of wax and petro-chemicals. The coming national elections - where these vultures and hyenas are hankering for each others blood and for gorging up bigger chunks of people's resources -- will only add more fuel to the fire. We have made a petition (click HERE) to the President of India. He is travelling far-flung to Croatia and even further to Bolivia and Chile. I hope he finds time in the next few days to visit the fasting young saint at Haridwar which is just 3-hours away from Delhi by road or rail before a precious life departs us. We have been trying to reach other key figures in the establishment Nitin Gadkari, the Ganga Minister, and Narendra Modi, who swore by her, proclaiming "Maa Ganga ne bulaya hai" -- only to betray her and go back on his words only hastening her to die faster as various reports cite that the Ganga waters are even more polluted and threatened by more dams in the past nearly 5 years of his regime. I shall seek all of your blessings and good wishes for the same.